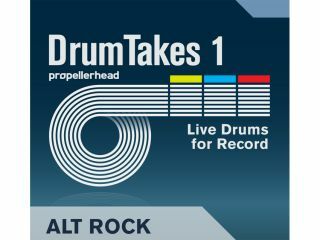 PRESS RELEASE: Propellerhead Software today announced the immediate availability of Record Drum Takes—big league rock and pop multitrack drums played by skilled session drummers for Propellerhead's brand new recording software Record. Record Drum Takes builds a steady foundation for any rock or pop creation. Each Drum Take ReFill arrives in Record song format with two separate three minute backing tracks of live drumming, organized in classic song form with intro, verse, chorus, bridge and breakdown, fills and variations. Alt Rock comes with hard-hitting, American drums with lots of attitude inspired by alternative and college rock, Folk Rock brings a large, warm sound, with plenty of room, while Dry Indie provides two classic, laidback, dry and distinct indie pop drum tracks. The differently styled tracks in the Record Drum Takes ReFills all come as multitrack recordings, allowing users to freely shape the drum sound by adjusting the levels of the independent kick, snare, hihat, room, ambient and other microphones. Cut across all eight drum tracks to arrange and rearrange once the drum sound has been mixed to perfection. Play along to the RDT drum arrangements, or paste them into an existing song. The entire drum mix will follow right along, and utilizing Record's automatic time-stretch, Drum Takes instantly adapts to the song's tempo. Included with the ReFill are also multisampled versions of the kits, for adding that extra snare or crash cymbal right where it is needed. Although recorded using state of the art technology in a professional recording facility and performed by an experienced drummer with an unmistakable feel for music—the playing in these ReFills is sparse and to the point: a perfect foundation for any alternative, pop or rock production. The three Record Drum Takes ReFills Alt Rock, Folk Rock and Dry Indie are available exclusively for download through Propellerhead's web shop today, at EUR €29 / USD $29 each.